Near the end of my previous post I mentioned Halo Orbit at a Lagrange Point, but presented very little detailed information. I think the subject is interesting and deserves more space on this blog, so here we go . . .
We have been sending satellites into halo orbits at Lagrange Points since the International Sun-Earth Explorer (ISEE-3) was Launched 12 August 1978 and placed into a Halo Orbit at the Sun-Earth L1 Lagrange Point 20 November 1978 and remained in operation there for a few years. 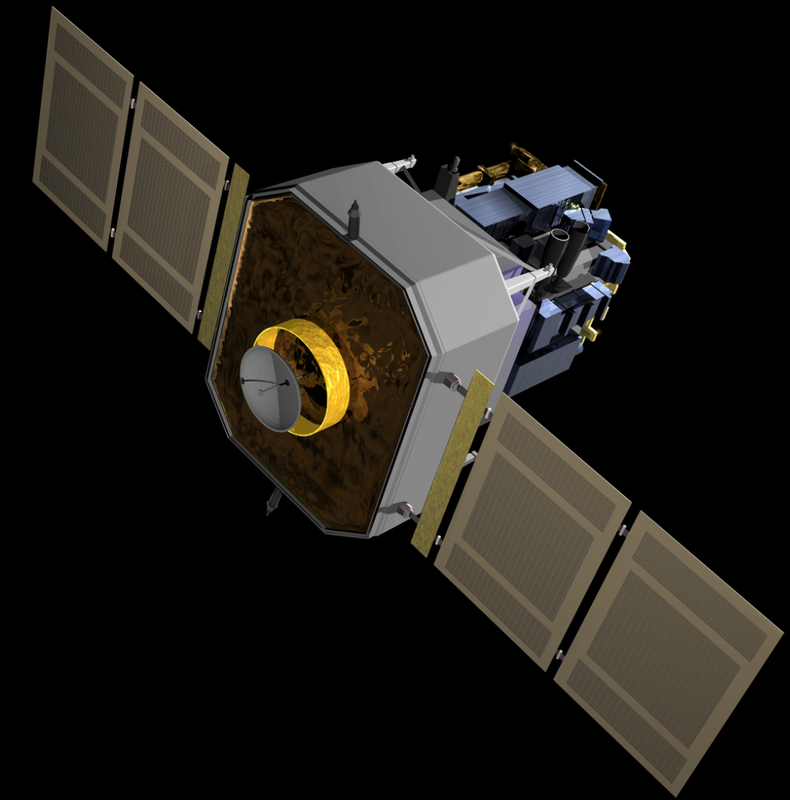 The ISSE-3 satellite’s needed an unobstructed view of the Sun so the Lagrange point located 1.5 million kilometers away from the Earth is an ideal place for it. 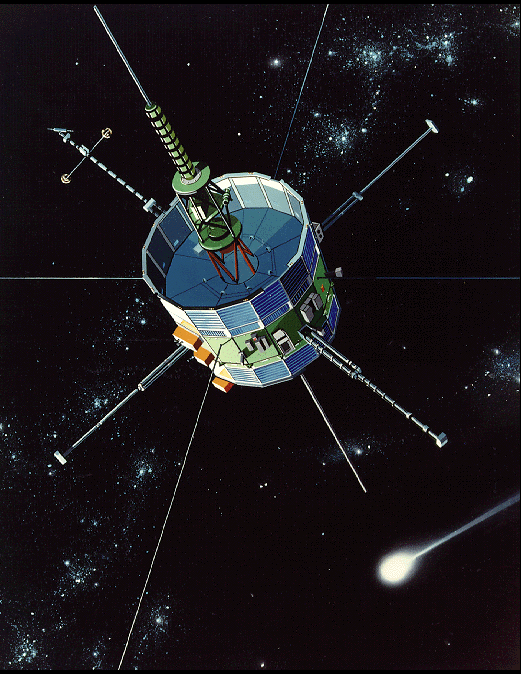 The artist drawing below illustrates ISEE-3 in orbit. 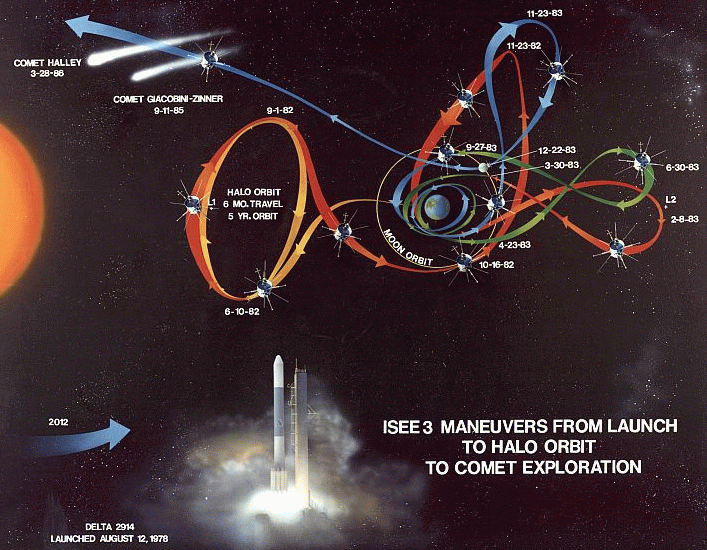 Getting a satellite into a Halo Orbit and/or chasing a comet is a rather complicated precess, as illustrated below . . . The rocket scientists at NASA have their work cut out for them ! 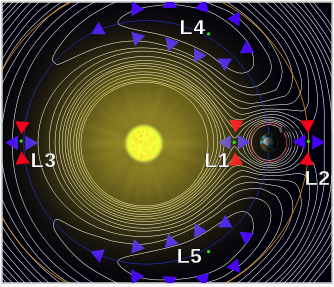 The simplified diagram below illustrates how a more recent satellite, Solar and Heliospheric Observatory (SOHO) was placed into a halo orbit at the L1 Sun-Earth Lagrange Point on 14 February 1996. In the diagram, the L1 point is where the X, Y, and Z axis join together. 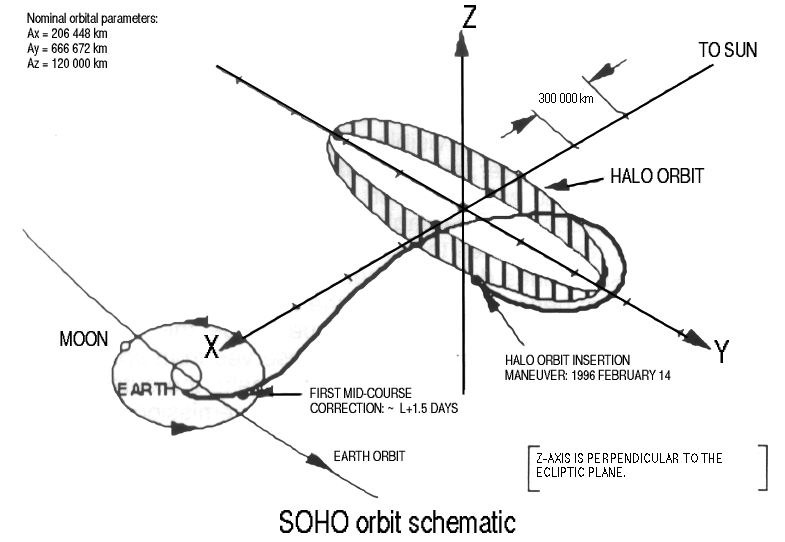 An artists drawing of SOHO in orbit . . .
Halo orbits tend to be unstable because of the “three body problem” – the problem that Newton (the genius who invented calculus) couldn’t figure out. Because of the unstable orbit “stationkeeping” is required to keep a satellite in a halo orbit. This gives Ground Controllers something to do between emergencies. Enough said – let us move on . . . This entry was posted in Miscellaneous Musings and tagged halo orbit, ISEE-3, Lagrange Point, SOHO. Bookmark the permalink.